Create an effortless ‘no makeup-makeup’ look and apply it as the last step in your skincare and/or makeup routine, just above your blush line for a healthy glow. 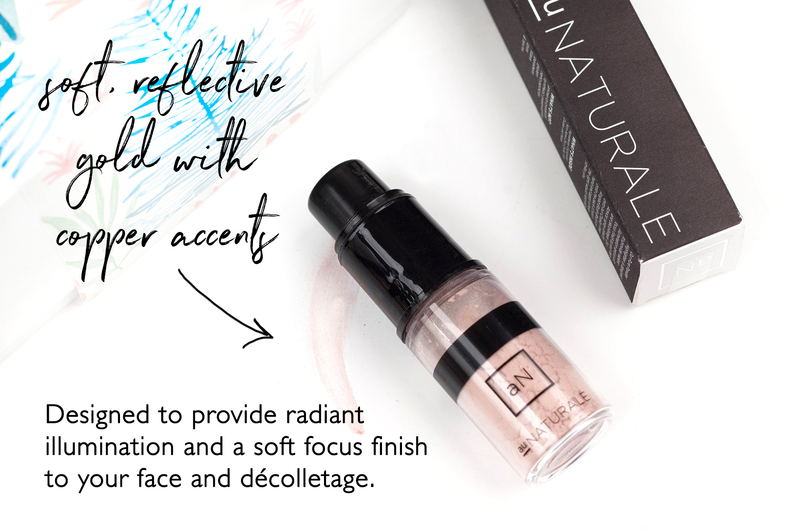 Highlight all areas where the sun would naturally strike for instant radiance – collar/shoulder bones, brow bones, cupids bow, cheek bones, bridge of nose. Use it as a gorgeous body shimmer! Spray on to brush and dust away. Dust over décolletage for a subtle yet stunning final touch to any look. Mix into a balm, face oil or serum (like Aloha Ambrosia Elixir) to create your own subtly tinted moisturizer. Mix into body oil or lotion and apply all over body for a dewy glow. Use as an illuminating eyeshadow! Mix with a hydrosol on the back of your hand and apply with your finger or an eyeshadow brush. Mix into a hair oil and apply sparingly to ends to add shine and smooth locks. Apply to the inner corner of eyes for a brightening effect. Apply down the length of your shin bones for a lengthening effect. To be honest, I wanted a highlighter that looked good on my skin tone and this is one of the first things I landed on. It has proven to be a color that works beautifully on an array of skin tones – so it has always been a staple in the line. Almost since the very beginning – about 4 years! Just like all of our powders, it is made with only the finest pigments. From the very beginning I have been careful to use minerals that are clean, non-nano and vegan!